At the Science Museum of Minnesota you can ask our featured Scientist on the Spot a question either using a computer interface or the old fashioned way – with a paper and pencil. Some of the handwritten questions veer a little off topic. But they are still good questions, and deserve answers. So here’s a question that was a little off topic for Noelle Beckman: “Can you tell me about Jupiter?”. Noelle is a graduate student at the University of Minnesota who studies how animals influence the make-up of tropical forests. So, I’ll take this one. Jupiter: Image courtesy NASA.Jupiter is the largest of the eight planets in our solar system (remember, poor Pluto is no longer considered a planet). 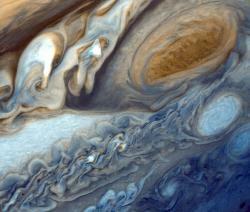 Jupiter is a gas giant, meaning it is primarily made up of hydrogen (90%) and helium (10%) gases. Jupiter probably has a rocky or metallic core, though we don’t know that for certain. Jupiter is huge – really, tremendously big. Not as big as the Sun, but bigger than all the planets (even including Pluto) combined. The Great Red Spot: Image courtesy NASA.When you look at the picture of Jupiter above, you can see that Jupiter’s atmosphere is banded – this banding is typical of gas giants (see pictures of the other gas giants in our solar system, Saturn, Uranus and Neptune, to see similar banding). The bands are the result of extremely fast winds (more than 400 miles per hour) that are blowing in opposite directions for each adjacent band. The interaction of these bands result in storms – and one of Jupiter’s storms, called the Great Red Spot, has been known to exist since the seventeenth century. Several NASA spacecraft have visited Jupiter, including Pioneers 10 & 11, Voyagers 1& 2, Galileo, New Horizons, Cassini-Huygens (on its way to Saturn), Ulysses (which used Jupiter in gravity-assist maneuver) – and probably others I was not able to dig up. Jupiter has many moons – from what I can tell the current count is 63 – 47 of them are smaller than 10 kilometers in diameter. The four best known moons are Io, Europa, Ganymede and Callisto. What else can I tell you? The comet Shoemaker-Levy 9 collided with Jupiter in 1994. You can see Jupiter in the night sky right now (in the southern sky during twilight and lower in the southwest after dark). Jupiter was named after the Roman god, Jupiter, who was very similar to Zeus in the Greek pantheon. In Pompeii there was a temple to Jupiter at the north end of the forum. Jupiter has faint planetary rings, like Saturn. I hope this answers this person’s question. See, I can tell you about Jupiter! I think Jupiter Would smell like pooooooooooooo because it contains METHAINE.